Terrell Daily Photo: Buy you a drink? 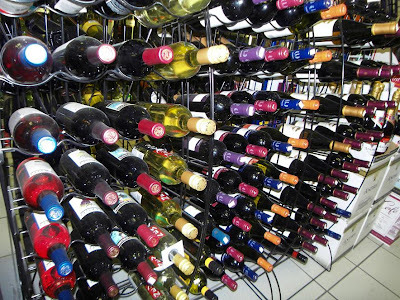 One of the wine racks at Tony's, my corner story. They look a little dusty. A rumor I posted a few days ago was incorrect. The Terrell Tribune has the announcement. Every morning this week I have said I was going to go to bed early that night. The Cowboys start their preseason tonight in California. Game starts at 9pm local time. I stayed up late last night watching old clips from the Midnight Special on You Tube. Maybe during the game tonight I will look up Don Kirshner's Rock Concert. Both were favorites of mine growing up. The owners of the puppy mill raided in Kaufman County have gone on Dallas TV saying they loved their animals and didn't neglect or abuse any of the almost 600 dogs....two people to care for almost 600 animals and they said they were not hurt, abused or mistreated. The same TV station ran a clip of a gentleman proposing marriage to his girlfriend inside a Wal-Mart. Its reported they ceremony will take place in the casino they both work in...... I wonder if they will live in his trailer or her trailer? Anyone have any extra stimulus money laying around? I was told my check is in the mail.